In its current transformation plans, the United States Army is reorganizing around Brigade Combat Teams (BCT), rather than divisions, as the lowest level of "unit of action", or balanced force that can operate independently. Among the most notable changes in the new BCT is a very substantial increase in intelligence, reconnaissance and related surveillance capability, in the form of the Reconnaissance, Surveillance and Target Acquisition Squadron (Brigade Combat Team) (RSTA Squadron). This Squadron reports to the brigade intelligence officer. It is complemented by the Military Intelligence Company, which adds substantial organic capability for access to information from higher-level commands and intelligence organizations, analytical tools, etc. 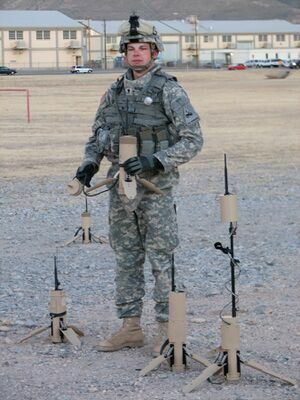 The Squadron's Reconnaissance Troops provide conventional ground reconnaissance enhanced with LRAS3 sensors and organic mortars for self-protection. Depending on the supported BCT type, the LRAS3 will be used either when mounted on a Stryker wheeled light armored vehicle, a Humvee truck, or on a man-portable tripod. Complementing the direct observations from the reconnaissance troops is a Surveillance Troop. It has a Troop headquarters (commanded by an military intelligence Captain) and three platoons: an unmanned aerial vehicle (UAV) Reconnaissance Platoon, a Ground Sensor Platoon, and an NBC (nuclear, biological and chemical) Reconnaissance Platoon (not addressed here). The UAV Reconnaissance Platoon provides the IBCT with an organic RSTA capability. Although the platoon is part of the RSTA Squadron, it will provide electro-optical, infrared, and communications-relay support to the BCT commander. Two classes of UAV will be available to the Squadron. XM156 Class I Unmanned Aerial Vehicles (UAV) both do reconnaissance and surveillance, and can mark targets. 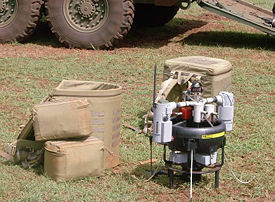 Total system weight, which includes the air vehicle, a control device, and ground support equipment is less than 51 pounds and is back-packable by two soldiers. This UAV can fly on its own, or be guided by soldiers. Its sensors can transfer their output to the unit's network. There is also a MQ-8 Army Fire Scout helicopter Class IV UAV, under the control of the brigade commander, that can act as a communications relay, do wide-area surveillance and cross-cue between sensors, and do on-board detection of chemical, biological and radiological threats. This vehicle uses the AN/APG-78 millimeter wave radar shared with the Longbow AH-64 Apache, AGM-114 Hellfire missiles, and the OH-58 Kiowa Warrior. A Ground Sensor Platoon monitors the totality of ground-based (for now) remote viewing of measurement and signature intelligence (MASINT)), such as ground surveillance radar and REMBASS II sensors . Those sensors are now hand-emplaced but in the future, their emplacement could be from the air or by robotic platforms. Today, the ground sensor platoon includes three squads containing a PROPHET ground signals intelligence SIGINT team and the MASINT-oriented consolidated GSR and REMBASS II team, and the systems are not fused. Block I PROPHET is based on the AN/PRD-13(V)2 originally developed for United States Army Special Forces. This page was last modified 22:32, 8 August 2010.